Yoga for healing burn out and relieving stress. “Clever girl” someone told me when I was a child and it felt good. I am clever, I am good enough, I am loved. To ensure I continued to get attention, I continued to be clever until finally I couldn’t stop. I simply could not stop and I felt sick when I wasn’t being clever, had not done everything I could have done and not worked so hard I was absolutely exhausted. Mental settings that worked for the child do not always work for the adult. From having been a happy, exuberant child who hopped, skipped and jumped around, always lending a hand when this was needed, I developed into a hard set, high performing, self-loathing career woman who was never satisfied. I was never clever enough. I was never enough anything so it was an endless struggle that continued every waking hour until my body finally said stop and burn out was the only option in order to find the time to slow down and reflect on myself and how I was living my life. When we are only there in our head all care and consideration goes out of the window. There is no time to think about how we feel, what we need or what we actually want, in our heart of hearts. We can sort everything in our head and wrap ourselves in a false feeling of control where we tell ourselves that everything is just fine and dandy. We can come up with reasons to explain what is happening and how things feel and why, but when you are living purely in your head there is a price to pay in terms of loneliness, confusion and stress. We need to go into our body if we are to find love and consideration, but things are not so fine and dandy in our body. We have feelings of all kinds in our body, loads of intuitive wisdom and consideration. As soon as we are in our body, we are considerate towards both ourselves and our surroundings. We feel that we are part of something larger and that it is difficult to hurt ourselves, others or the planet on which we live. Because we feel. When we are in our body, we feel that we are present, calm and that we belong. We say that we love but we cannot show that in actions if we do not love ourselves first. Self-loathing will always seep through our defences and casts its claws on our nearest and dearest. Even though we say we love them. How we behave towards ourselves is how we behave towards the people around us. Always. If you are a clever doer others around you will feel your whistling whip. If you are self-critical, those around you will feel your high expectations on them, too. If you are carefree and forgiving, the people around you will feel happy and relaxed. A new year. As the sign I once saw said: “You always get a second chance, it’s called tomorrow”. A new year is a good opportunity to start a second chance where I will try to be forgiving and love myself so I can unreservedly love and forgive others. When I have forgiven myself, I will have forgiven everything. 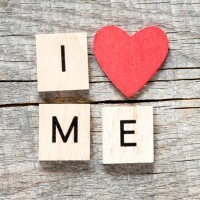 When I love myself, I can love – for real. 2016 – here I come. Kristiane on Who am I?